We supply frost cover / crop cover at wholesale prices per meter ,so your plants can survive the cold this winter.Frost cover provides a barrier between frost and yor plants to prevent frost damage.We advise you to cover all cold sensitive plants so they look beautiful come spring. Frost cover in stock now! ''Soil, warmed by the sun in the daytime, is the source of heat for frost protection at night. Moist, smooth soil absorbs more heat. 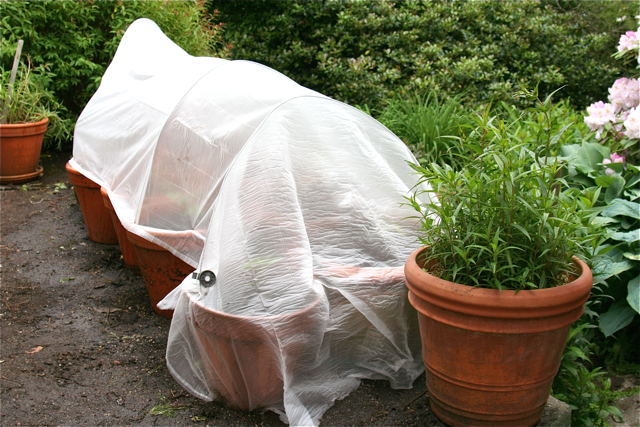 To trap heat from the soil around young vegetables at night, place a covering that is low to the ground and spreading. To recharge the heat source for the next night, any covering must allow sunlight to shine through to the soil or must be removed in the daytime.